There had been some speculation that Assemblyman Reed Gusciora would leave the legislature and be nominated for a Superior Court judgeship by Governor Christie – a man who once called Gusciora “Numbnuts”. But in one of the first shots fired for the 2015 election season, Gusciora today announced his intention to run for re-election. 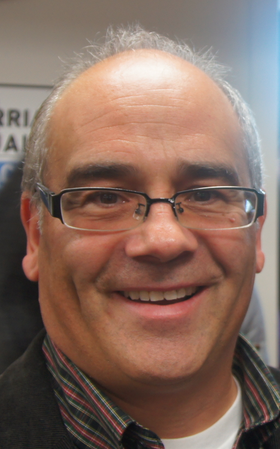 As one of only two openly gay members of the 120-seat legislature, Gusciora was at the forefront of the marriage equality debate and is an advocate for progressive causes. His re-election kickoff will take place on Tuesday, November 13 in Princeton. In the upcoming N. J. elections for the U. S. House of Representatives there are now three vacant seats. These Representatives have announced their resignations: Rob Andrews (D-CD1) first elected 1990, Rush Holt (D-CD12) first elected in 1998, and Jon Runyan (R-CD3) first elected 2010. Soon Democrats may take over a Republican seat, retain two Democratic seats with new members, and add two women to our delegation. See more about this opportunity below the fold. Ok, NJ Lesbians and Gays have “marriage equality” … We’ve got LGBT workplace protections, inclusive hate crimes, anti-bullying laws and a trans inclusive gay reparative therapy law. So, really, what’s next? Anything? Can we go home now? Well, not quite. More on this, and how to find out about the LGBT Dems organizing meeting Tuesday in Edison, below the fold. Why did the Governor cross the road? About a dozen “chickens” have arrived at the Statehouse. With Chris Christie’s name on them. 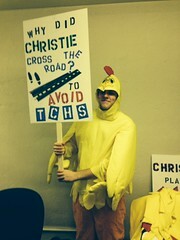 It’s a student protest from the kids at from TCNJ college students on behalf of kids from Trenton Central High School because their Governor is too chicken to ride down the street and face them for a frank talk about their school. They call it the Tasty Chicken Brigade. Trenton Central High School has black mold, and some of its ceilings are falling down. The walls are crumbling. And when the roof leaks, which is often, it sets off the fire alarms. This is where the students go to school. Five days a week. Barbara Buono has seen it; the stairwell students call “the waterfall,” the plywood that substitutes for solid flooring. And she’s called on the Governor to release SDA funds to take care of the situation. Numerous legislators – including Assembly members Reed Gusciora and Bonnie Watson Coleman and Sen. Shirley Turner – have tried to get Gov. 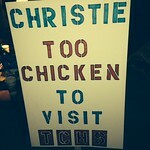 Christie to come to the school and visit and talk to his constituents, the kids who go there and the educators who teach there. Even the high school students have had to take to the streets to rally for their own health and well-being, saying they need to be their own advocates in the face of the state’s failure to help them. But Christie is, essentially, ignoring all this, as he does his campaign bus victory laps talking to adoring Republicans about how great a job he says he did rebuilding after a hurricane. Good for the students. My favorite sign is the “give a cluck” one, below the fold.